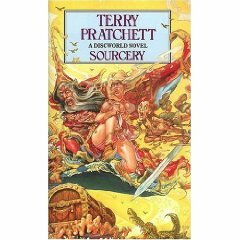 Sourcery by Terry Pratchett – It's Time to Read! There was an eighth son of an eighth son. He was, quite naturally, a wizard. And there it should have ended. However (for reasons we’d better not go into), he had seven sons. And then he had an eighth son…a wizard squared…a source of magic…a Sourcerer. Sourcery sees the return of Rincewind and the luggage as the Discworld faces its greatest – and funniest – challenge yet. As mentioned, the characters were fantastic. I love Rincewind, and how he survives purely on being scared and running away. Death was full of his usual humour, although this time he was added by War, Famine and Pestilence. I love how Pratchett personifies things such as death and war – unique, and pure brilliance. The Luggage had it’s own storyline too, which I loved. Such a funny object – I want one! And of the new characters, I loved Nigel. Training to be a barbarian through a book was just genius! As usual, I was left feeling satisfied and I am now longing for my next installment of the Discworld magic. I am hooked to these books.